Stunning log home with 616 feet of crystal clear water front and over 10 acres of privacy. 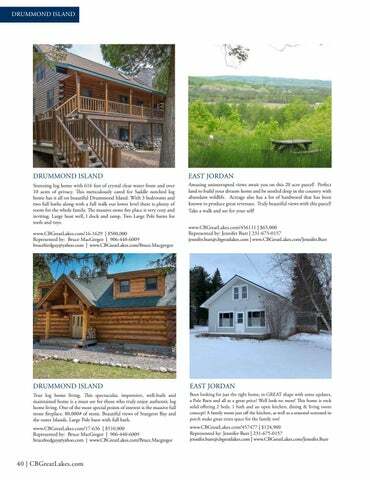 This meticulously cared for Saddle notched log home has it all on beautiful Drummond Island. With 3 bedrooms and two full baths along with a full walk out lower level there is plenty of room for the whole family. The massive stone fire place is very cozy and inviting. Large boat well, l dock and ramp. Two Large Pole barns for tools and toys. Amazing uninterupted views await you on this 20 acre parcel! Perfect land to build your dreasm home and be nestled deep in the country with abundant wildlife. Acreage also has a lot of hardwood that has been known to produce great revenues. Truly beautiful views with this parcel! Take a walk and see for your self! True log home living. This spectacular, impressive, well-built and maintained home is a must see for those who truly enjoy authentic log home living. One of the most special points of interest is the massive full stone fireplace. 80,000# of stone. Beautiful views of Sturgeon Bay and the outer Islands. Large Pole barn with full bath. Been looking for just the right home, in GREAT shape with some updates, a Pole Barn and all at a great price? Well look no more! This home is rock solid offering 2 beds, 1 bath and an open kitchen, dining & living room concept! A family room just off the kitchen, as well as a seasonal screened in porch make great extra space for the family too!